Red-Starred Shickelgruber, the Arch-deceiver and wannabe World Emperor, was himself deceived. At Winter’s Grace a “ tongues” telegram in a heavenly language came with the interpretation-translation in English: “I will put a lying serpent upon his bosom, and the wolf will listen and be taken in the nets of false counsel--but the lying serpent himself will not be taken.” Thus for Martin Bormann, Shickelgruber’s closest advisor, who assured the dictator that he would triumph even with the Red Army surrounding Berlin! And, true to the Lord’s word, Bormann was never found after the Chancellery bunker was captured. Nazi Field Marshall Guderian, the great military theorist and battlefield commander who spearheaded Operation Barbarossa, the Nazi’s invasion of Russia? In 1941 his Panzer group, the Fourth Panzer Army, led the Nazi Germany’s most ambitious and daring campaign and the drive on Moscow, but Shickelgruber ordered Guderian and his Panzers toward Kiev and Leningrad toward the middle of summer, causing a rupture between Guderian and Shickelgruber, so that Guderian, who disputed the move toward Kiev, was dismissed October 25, 1941, though his judgment proved right in the disastrous delay Shickelgruber’s intervention caused the whole Russian campaign. Djugashvilligrad--that was the rock where, of course, the “horned” dragon-head of Nazi might in Operation Barbarossa, was fatally smashed. From that defeat on it was nothing but disastrous retreat for Shickelgruber’s forces amidst the snows and blizzard conditions of the Russian and Ukrainian plains. Yet, in 1940, Shickelgruber stood astride the world like the Colossus of Rhodes. Singly, or even allied, he had n o match on Earth. His Luftwaffe alone outnumbered Britain’s fighting planes ten to one. The invasion of Britain, Operation Sea Lion, should have been a holiday walk-in. Bless the Lord, O my soul! O Lord my God, You are very great! You are clothed with honor and majesty, Who cover Yourself with light as a garment, Who stretch out the heavens like a curtain. He lays the beams of His upper chambers on the waves, Who makes the the clouds His chariot, Who walks on the wings of the wind. When she finished, strange, archaic words poured forth from Sam’s mouth, which he could not have concocted, and Hildegard gave the interpretation, which sounded like a nursery rhyme to everyone and seemed to make no sense to them until Joy Luck Yoo had a vision, and it described a fighting plane, British, mortally struck in battle high over the country, and it lost both wings, and was tumbling downwards. Suddenly, the plane leveled out, and began heading toward the coast as if invisible angels were bearing it up on their mighty wings! Both wings shot off, the Spitfire’s fuselage tumbled and dropped like a stone, the flier unable to leap free before it was too late. Switching off the engine by automatic reflex action, he waited. In seconds that seemed horribly prolonged, Francis Cecil, Lord St. Aubyn of the Mount of St. Michael’s on the Cornish coast, saw hedgerows and fields whirling overhead, to each side, and then directly beneath. 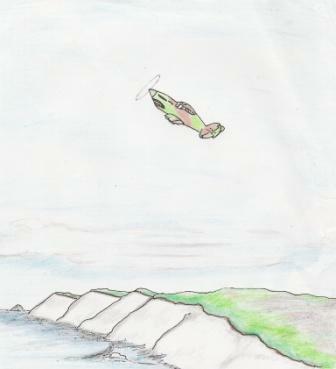 Suddenly, with a gut-wrenching sensation, he felt as if he were stretched, and the Spitfire leveled out, gliding effortlessly, without sound, except for wind roaring through the cracks in his smashed cockpit. At that point he could have bailed out, hoping his parachute held good, but he saw he was too low--below 1,000 feet. And the plane was gradually descending. He had lost fifty feet, then an hundred, then two hundred. But there was no way the plane could have been gliding! It was absolutely impossible with the Spitfire’s design and only two pitiful stubs of the main wings. Fuel streaked both sides, he saw, and there were gaping holes where the fuel lines had ruptured. But no wings! He couldn’t possibly be flying, but he was! A thought flashed into his mind--could the jet stream have been deflected? Was it somehow supporting him? Trapped in the doomed wreck, he had to stay put. Perhaps, it would glide close enough toward the ground where he could hop out, and break a bone or two but still survive if he picked a soft enough field. He realized his thoughts were utterly mad and silly, but he thought them anyway, having no time to consider his situation in a properly rational, organized manner. Commander of one of the RAF’s nineteen squadrons of single-seat Submarine Spitfires totaling 1,400 aircraft, Francis Cecil was desperate to make contact with his men, who were still maneuvering in the latest attack above the approaches to London. His radio, however, filled with crackling static, and no one answered his shouted messages. But what good would his location do Supreme Air Headquarters at Chequers, he thought, if they couldn’t hear him? With no other choice but to leap out and kill himself at five hundred feet, he stayed with the craft as it flew on and on down along the coast. Finally, a half hour into his flight, it veered directly toward the coast. He saw towns--Dorchester? Bridport? And a grey-stone village cut off from the sea, which he knew was a bay of the Channel called Lyme. Just under him now passed the freak bank of gravel dunes called Chesil Banks! He knew them well from making them a landmark for his sighting his location in case his instruments were disabled. Portland to his right, and Weymouth his left, and--what was that straight ahead? The countryside was quiet on one side of the Banks, but on the other there reared a witch’s cauldron of swirling wind, waves, and flying mist. Just beyond lay the open waters of the Channel, still ice-flecked at this time of year. “Another storm striking the Banks,” he thought. They were common enough at a point where Africa’s warmth and the glacier’s polar breath were always colliding between the two land masses of Europe and the British Isles. Yet just beyond the storm front he saw a vast fleet coming in to port. British? His craft moved slowly toward the converging armada, and then he realized they were the enemy. It was all Nazi. The dreaded and expected Operation Sea Lion! Madman Shickelgruber’s invasion forces! But that was all the glimpse he got at the moment, as his wingless Spitfire turned and circled. He was climbing a bit too, his prop spinning idly in the wind this way and that. Fifty, then a hundred, then two hundred feet. He could see better now, the whole Channel, in fact, and the long lines of Nazi craft stretching to Cherbourg, each protected by cheek-to-jowl packed cordons of destroyers and U-boats. What? They were heading directly at Chesil Banks, unquestionably the worst place on all the English coast to land, though no land defenses were deployed there because of the lack of industry and so few inhabitants! He watched as the first landing craft passed through the thick curtain of flying mist and tumbled in the maelstrom of tremendous tidal waters that spun round and round, grinding and polishing the rocks and flinging them up on the banks. Dozens of vessels vanished in an instant, with more dozens joining them. Without an alarm going back to warn the others, like a fatal river, the Nazi forces poured through the mist-curtain and were being destroyed before his eyes! Francis Cecil stared transfixed by the spectacle, forgetting his own peril entirely as Operation Sea Lion was swallowed up by the roaring meat-grinder of the White Dragon’s jaws! In a daze he scarcely noticed his wingless plane veer away after circling the Banks a last time, upon which the thirty-foot waves were flinging untold tons of Nazi amaments and ships, all smashed and chewed to pieces and evenly sorted from large to lesser grades and weights. He might have lost consciousness, he was so out of it. A few minutes later he was jolted back to his senses when the the plane touched softly down on Trentonwych Aerodrome’s grass field, as lightly as any down feather of a goose, with only a little scraping on the belly as it flattened a few mole hills. Having chosen his strategy, Francis Cecil faced the men running out with a fire truck from the hangars to greet him. Still thinking of the "better chaps" who had won imperishable glory at the price of their young lives, for their sake he even managed a raffish smile and a cheery wave of the hand.